With our streamlined packaging system, we are capable of meeting standard as well as tailored packaging needs of the patrons. And, we make use of premium material for packaging. We are highly acknowledged for delivering the orders within the stipulated time frame as we have excellent transit facility. 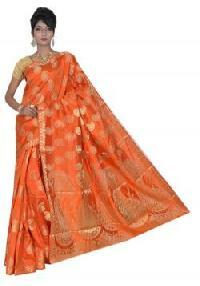 We make available, Semi Tussar Silk Sarees, which are widely demanded owing to their quality as well as variety and are in sync with the latest fashion trends.